Oxford University Press, USA, 9780195169522, 304pp. Drawing on his experience in creating fictional bad guys, crime novelist Lawrence Block surveys the underside of American history through fifty of its most infamous characters. Some, like Jesse James, Bonnie Parker, and Joe Colombo, led a life of crime; others, like John Wilkes Booth and John White Webster, committed one notorious act. Some, like Pretty Boy Floyd or the elusive thief Railroad Bill, have become folk heroes, whether or not the real details of their lives matched the myths they inspired. Others, like Ed Gein and Ted Bundy, will be forever reviled. Block introduces each biography with a writer's eye for character and a good story. He begins the book with a short essay that considers how Americans have defined and regarded villains through history. The biographies, culled from the pages of the American National Biography and illustrated with archival photographs, describe each villain's background, exploits, and eventual fate--often with unexpected details. The convicted killer Nathan Leopold, for example, became the administrator of a leprosy hospital after his parole. The gangster Dutch Schultz was known not only for his bootlegging expertise but also for his cheap, ill-fitting clothes. The stagecoach bandit Black Bart fancied himself a poet (or, as he put it, "PO8"). And when outlaw Bill Doolin finally met his end, only a rusting buggy axle marked his grave. 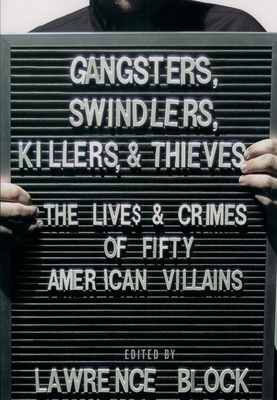 Ideal for readers of true crime, crime fiction, and history, Gangsters, Swindlers, Killers, and Thieves brings a fresh perspective to American's fascination with crime and its perpetrators. Lawrence Block, a Mystery Writers of America Grand Master and multiple winner of the Edgar, Shamus, and Maltese Falcon awards, has written more than 50 books, including Small Town, Hope to Die, Hit List, and The Burglar in the Rye. He lives in New York City.